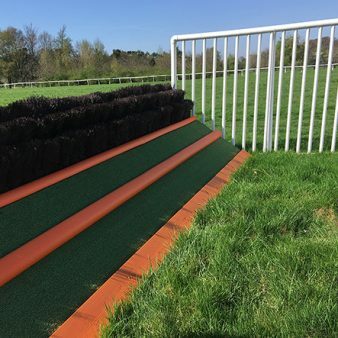 All of the schooling fences we have for sale here at Wattfences are made in a variety of options to suit your individual requirements. Made to BHA specifications and adhering to all licensing requirements. Made from quality timber or metal frames, with or without birch, fully padded and built to a high standard. We work with trainers to fulfil all their equine fencing requirements. Plain Steeplechase schooling sections 6ft wide, 4ft 2” high. Ditch Steeplechase schooling sections 6ft wide, 4ft 2” high. Plastic Birch metal frame Steeplechase 16ft wide. Available with or without Birch. Other sizes of sections are available on request.